Internationally acclaimed storyteller Tim Ralphs, rising folk star Roo Bramley have been working together for years as part of “Three Acres and a Cow – a history of land rights and protest.” But now they turn their attention to the cosy surrounds Walkley’s pubs to bring you the tale behind your ale. 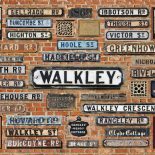 Walkley grew from fields, farms and a few buildings during the Victorian period. As the suburb was built and inhabited, pubs were important the social centres of the day. Tim and Too will take you back to the Victorian pub with stories based on the discoveries of Walkley Historians, accompanied with songs of the time. The journey meanders through fine ale, coroner’s inquests and gas explosions, from good cheer to the temperance movement – all in the space between two trips to the bar. The Florist, 185 Walkley Road. Tuesday, 6th November. The Blind Monkey, 279 Whitehouse Lane. Wednesday, 14th November. The Walkley Cottage, 46 Bole Hill Road. Monday, 19th November. Settle in for 7:30pm. The show ends by 9pm. This entry was posted on September 28, 2018 by Bill Bevan in Events, Pubs, Victorian Walkley.